Welcome to the Triple J Tech Talk page! 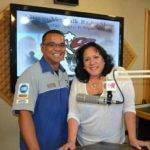 Triple J Auto Group is committed to bringing the best service tech to Guam, and our very own Mike Fejeran joins Patti Arroyo at K57 every week on Thursday at 9:30am to keep you informed. Tech Talk Show Details – Click Your Favorite to Learn More! Topics: Vibrations in Idle, Apps for Repairs, Check Engine Light. Topics: Fuel Additives, Clean Engines, Fuel Economy, Fuel Quality, Engine Pinging. Topics: Floorboard Flooding, New Shocks Make Noise, Push Starting Cars. Topics: Airbag Recalls, Trading In Old Cars, Car Battery Draining, Seatbelt Problems. Topics: Transmission Care, Wire Harnesses, Insect Infestations, Steep Hill Parking. Topics: Oil types, Why Safety Inspections Matter, Alignment, Windshield Wipers. Topics: Shifting and Downshifting, Tire Lifespan, Power Windows, Dome Lights. Topics: Hybrid Batteries, How to Buy Used, Miles to Empty Gauge. Topics: Driving Downhill, Premium Gas, What Station Has the Best Gas, Speedometer. Topics: Squeaking in Reverse, New Car Smell, Hard Clutch, Transmission Changes. Topics: Tire Pressure Monitor, Gas Additives, Premium Gas, Key Duplication. Topics: Jumper cables, Audio System Upgrades, Filling up Gas, Airbags. Topics: Transmission Fluid, Black Primer Paint Popularity, Warming Up Cars. Topics: Metal Grinding in Brakes, Driving Techniques for Heavy Rains, Mitsubishi. Topics: Common Brake Sounds, Downpours and Cars, Car Doesn’t Shift Right. Topics: Battery Problems, Replacement and Recharging, Alternator Testing, Brake Problems. Topics: Vehicle Performance, Timing Belts, Wet Season and Flooding Issues. Topics: Brake Sounds and Maintenance, Puncture Resistance in Tires, Maintenance. Topics: Mazda Engine Mounts, Car Doesn’t Start, Transmission Problems, A/C. Topics: How Heat Affects Cars, Oil Changes, Bad Gas Problems. Scroll down to find your favorite show and listen! Have a parts or service question about your vehicle? Click below to ask us! Schedule Service for Ford, Mazda, Lincoln or commercial vehicles. Click below! Schedule Service for Honda, Acura, Kia or all pre-owned vehicles. Click below!